This paper was first given at the Stockholm Conference on Human Rights, May 26, 2015. The second part will appear tomorrow. What is this need? Why should we exercise ourselves over questions of history and meaning? Why not just take satisfaction in what has been achieved and carry on as before? Why, to put the matter in disciplinary terms, introduce humanistic reflection into a domain where the more instrumental and less reflective discourses of law and public policy, buoyed by social, political, and institutional consensus, have served so well? I can’t enter into the mind of the author or authors of this invitation, but it does seem to me that both the need and the slight hesitation in expressing it are entirely appropriate, and in fact lead into deep and relatively unexplored areas concerning the relation of the concept of human rights and the academic disciplines. Parenthetically, I would like to add that this is precisely the kind of inquiry that royal academies should be proud to support. This foundational ahistoricality, or acriticality, has been implicitly reaffirmed in the way that the subject of human rights has been studied in the academy, where schools of law or public policy have largely claimed the concept as their own. These disciplines document, track, chronicle, organize. Their work is useful, informative, and necessary, but it does not address the need for reflection on history and meaning on which the organizers of this conference insist. In fact, their way of handling human rights has in part created this need. But before committing ourselves to such reflection, we may well consider what the consequences of reflection might be. Will such reflection advance the cause, or is it somehow possible that the worldly and institutional success of human rights has been connected to the refusal of reflection? The philosophical literature on the ground, starting-point, or premises of human rights is vast, with human rights being linked to a wide range of philosophical and religious traditions. All I can say about that literature here is that such foundational questions as “the human” and “rights” have been opened for debate as questions that show no sign of being resolved in the near future. Whether such debates advance or retard the progress of human rights is itself open to question, but I think the evidence for “advance” is very scanty. The recent history of historical reflection on human rights is more calculable. That history might be said to have been inaugurated by two articles, the first by Thomas Laqueur called “Bodies, Details, and the Humanitarian Narrative,” which traced the roots of modern human rights discourse to humanitarian movements of the nineteenth century; and the second, by Richard Rorty, who argued in 1993 for a program of cultural education that would expand the range of empathy and inhibit attempts to depict some people as inhuman or subhuman. In 2000, Michael Ignatieff gave two talks, subsequently published in a volume with commentary from several scholars under the title Human Rights as Politics and Idolatry, which mentioned the great successes of the human rights movement, but also noted objections raised to the concept from Asia, the Islamic world, and in the West. These objections included the suspicion that the concept was implicitly Western and even imperial; that it promoted social and economic rights such as the right to work but ignored civil and political rights; and that it favored sympathetic suffering individuals at the expense of suffering populations. Then, in 2007, the historian Lynn Hunt undertook a new history of the concept, tracing its origin to the sentimental education of the populace accomplished by the artistic and philosophical culture of the late eighteenth century. In the same year, Joseph Slaughter published Human Rights, Inc., in which he argued for the particular influence of the bildungsroman, which provided a conceptual vocabulary and a social vision that, he claimed, made possible the development of a concept of human rights. The effect of all this work was to depict human rights not as a transcultural much less a transcendental norm, but as a cultural expression, a contingent reflection of a given historical milieu. Like the philosophical debates, these historical exercises undercut the case for universal human rights, as Pillay and others have acknowledged. The overarching and accelerating tendency of humanistic scholarship in recent years has been to describe human rights as a fetish of the privileged West, even as a kind of tactic of power cunningly designed to appear “natural and immutable,” to recall Malik’s terms, so as better to disable any potential opposition. Like war in von Clausewitz’s famous formulation, human rights, this argument goes, is politics by other means. Samuel Moyn’s influential book The Last Utopia (2012), exemplified this tendency, proposing a shockingly abbreviated timeline for human rights—which, he argues, only became an important political force in the 1970s—and the most uninspiring of origins, in the ruins of earlier political utopias. 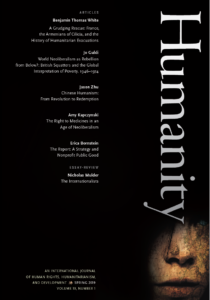 Considering all this work, we can, I think, say that historical reflection on human rights has a corrosive effect on the concept it studies, an effect that has become even more pronounced in more recent studies that have argued that the end for human rights is not only nigh, but has already arrived—human rights is not just the “last utopia” but last year’s utopia. I am thinking here of Stephen Hopgood’s The Endtimes of Human Rights (2014), and Eric Posner’s Twilight of Human Rights Law (2014), both of which maintain that the era of human rights law is now in injury time because the ideological and political forces that sustained it, prominently including the political will and moral standing of the United States, have either faltered or have been so badly compromised that they can no longer defend what is in any event indefensible. Both Hopgood and Posner would, I think, agree that one of the biggest current threats to actual human rights is, precisely, “human rights,” which they understand to be the kind and loving face of imperial power. Posner lays particular emphasis on the fact that most of the countries that have signed various human rights agreements are to one degree or another guilty of human rights violations. The United States, as the most sanctimonious as well as the most powerful nation, is conspicuous in this regard, having been shown to be in deliberate and sustained violation of several of the most important “substantive” human rights, including the right to life (the durable popular support for the death penalty), the right to a fair trial (Guantanamo, black sites around the world), the right to freedom from torture (Abu Ghraib), the traditional rules of just war (drones), not to mention the disturbing fact that a more controversial and certainly less universal right, to keep and bear arms, has been granted such a singular stature that other rights have been compromised jeopardized, or negated. This dismal inventory of complaints could be extended, but the point would remain the same: that “reflection” on history and meaning does not necessarily advance the cause of human rights because the tendency of reflection in general is to reveal its subject to be not just a product of history or an instrument of power, but something more sinister, a mere screen for other forces, serving other interests than those it claims to embrace, and systematically misrepresenting its motivations and effects. 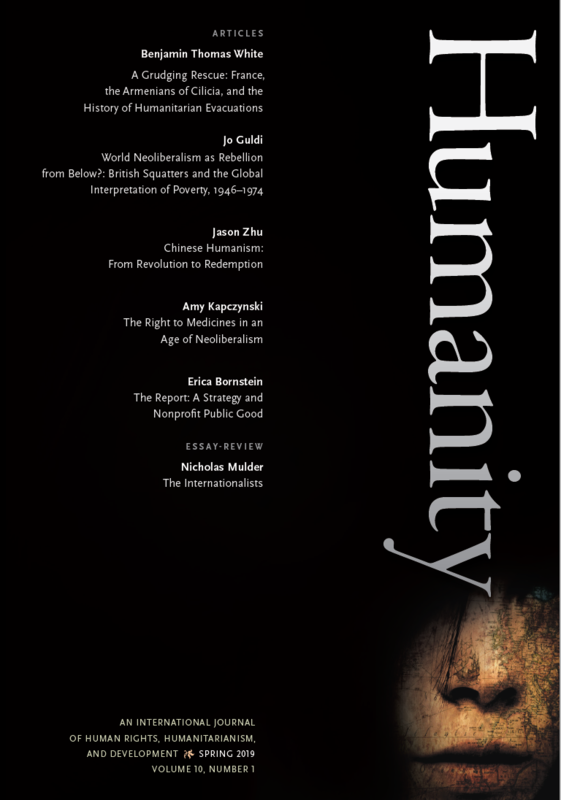 Indeed, unmasking human rights has become one of the most robust areas of humanistic scholarship today, a thriving interdisciplinary, multinational undertaking prosecuted with undisguised enthusiasm by scholars and activists all over the world. The demystifying critics have discovered in human rights an extraordinary wealth of things other than human rights, including, in addition to those already mentioned, the self-interested scheming of corporations, the grinding effects of global capital, an opportunity for celebrity philanthropy, and a particularly devious form of neoliberalism. Among the supposed victims of the regime of human rights, as it is sometimes called, are so-called “third-world” societies, any country that resists American hegemony, women, other causes such as health care that could put the resources currently devoted to human rights to better purpose, and the virtues of tolerance and realism. Moyn sums up the general premise of the contemporary critique of human rights by saying that human rights are “an ornament on a tragic world they do not transform.” Others would add as a kind of friendly amendment that human rights are the tragedy itself. Navanetham Pillay, “Are Human Rights Universal?” UN Chronicle: http://unchronicle.un.org/article/are-human-rights-universal/. Charles Malik, quoted in Thomas W. Jacobson, “Ambassador Charles Malik and the Universal Declaration of Human Rights” (Focus on the Family: International Government Affairs Department, n.d., http://www.idppcenter.com/UDHR-Dr_Malik_book_summary.pdf) 5-6. This online text contains excerpts from a compilation of Malik’s speeches and writings edited by Habib C. Malik, The Challenge of Human Rights: Charles Malik and the Universal Declaration. Thomas Laqueur, “Bodies, Details, and the Humanitarian Narrative,” in Lynn Hunt, ed., The New Cultural History (Berkeley: University of California Press, 1989); Richard Rorty, “Human Rights, Rationality, and Sentimentality,” in Stephen Shute and Susan Hurley, eds., On Human Rights (New York: Basic Books, 1993), 111–34. Gutmann (Princeton: Princeton University Press, 2003). Lynn Hunt, Inventing Human Rights: A History (New York: W. W. Norton & Company, 2007). Joseph Slaughter, Human Rights, Inc.: The World Novel, Narrative Form, and International Law (New York: Fordham University Press, 2007). Stephen Hopgood, The Endtimes for Human Rights (Ithaca: Cornell University Press, 2014; Eric Posner, The Twilight of Human Rights Law (New York: Oxford University Press, 2014). Samuel Moyn, Human Rights and the Uses of History (New York: Verso, 2014), 143.